Nepenthales is a taxonomic order of carnivorous plants, which include the sundew and pitcher plants. In the plant kingdom, there are very few that have developed a certain taste for other organisms. These insectivorous heterotrophs, also known as the carnivorous plants, have been found all over the world in countless environments with one common characteristic. These plants attract, capture and consume prey.These types of plans have learned to adapt and make use of their abilities to survive. Since the creation, these carnivorous plants have undergone adaptations that have enabled them to survive competition with other species over limited resources. Evidence in the fossil record reveals the existence of these plants prior to the Biblical flood. These carnivorous plants use trickery to entice their prey into thinking the plant holds a meal for them. When in reality it is the insects that become the meal. The pitchers of Nepenthes are mottled, a pattern that insects associate with decaying flesh, and thus the pitcher looks like an easy meal. Scattered along the leaves and stems, are nectar glands that produce a sweet fluid whose presence and smell also attract insects. These glands are particularly dense around the mouth of the pitcher, but an insect trying to feed there will find that the lip of the pitcher is slippery and tumble into the waiting trap. These plants are similar in they all are carnivorious, but that is where they begin to be removed. They are all trap plants and use digestive juices to break down their captured prey, while still enticing other prey into them. Inside, pitcher traps are lined with many thousands of tiny wax scales. Because these scales are made to fall off easily on contact, insects attempting to grasp them while trying to escape will find their footing loose and slide further into the pitcher traps along the slippery surface. At the bottom of the trap is a pool of fluid containing digestive enzymes, where the hapless insects drown and are digested for their nutrients. 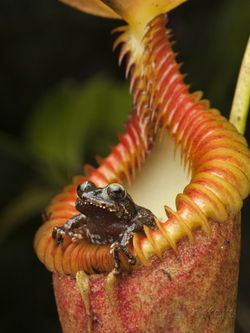 Unlike other carnivorous plants in the Nepenthales, Nepenthes traps are reusable, and may trap many victims in the same pool of digestive fluid. The video depicts ands explains the three families within the Nepenthes order. ↑ 1.0 1.1 1.2 1.3 1.4 1.5 Scott, Erin. Kirkner, Lara. Shin, Jane. Veeral, Desai. Chan, James. Nepenthales flytraps, sundews, & Asian pitchers Nepenthales. Web. May 21, 2017 (accessed). ↑ 4.0 4.1 A.S.Rob., S.McPherson & V.Heinrich Nepenthes attenboroughii. The red List. Web. May 14, 2017 (accessed). This page was last modified on 27 May 2017, at 21:23.